It’s time to go to work. 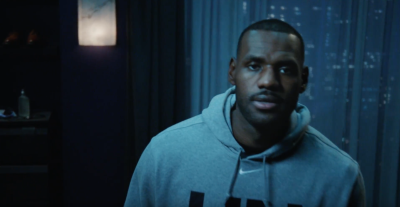 Step into LeBron James’ world like never before and watch him strive for greatness in the latest commercial for the Samsung Gear VR created by ad shop 72andSunny. At 5:34AM, LeBron James receives a phone call from a man who tells him he needs to start working, unless he's contempt with his accomplishments. He responds that it's all about getting one for "The Land" also known as his hometown, Cleveland. He begins his work just like everyone else. People are bustling to work and Public Enemy's "Welcome to the Terrordome" begins playing as school children exit the subway. As the camera continues to pass through different areas of the city, construction workers, office workers, TV news anchors, restaurant kitchen workers all mimic the lyrics of the song in one long sequence. The camera finally comes to a rest on LeBron, just outside the doors of a gym where he beats his chest to the title of the song being rapped.